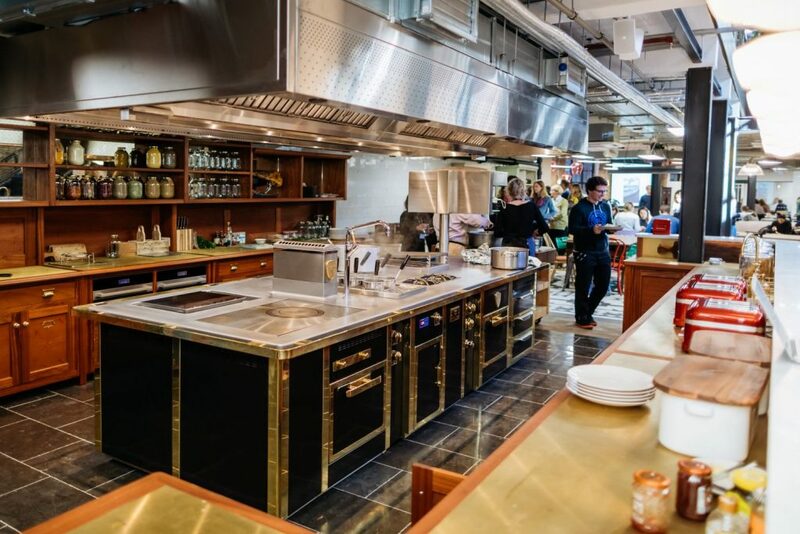 A heavy duty bespoke Charvet cooking suite is the crown jewel in a spectacular commercial kitchen installed at the new offices of the Jamie Oliver Group. While Charvet is accustomed to its suites being put into Michelin star restaurants and top hotels, this could be the first time that one has ever been specified for use in a working office environment. The new North London HQ of the Jamie Oliver Group is home to more than 130 staff who work across the company’s broad media portfolio, which encompasses recipe books, TV, social media content, licensing and marketing. Visitors to the facility are greeted by the kitchen as soon as they walk through the doors, which was a deliberate move on the company’s part. “We always wanted a commercial kitchen to be at the forefront of the new office and this is very much a showpiece space in the sense that it is the first thing you see when you enter the building,” Rob Hannington, facilities manager at the Jamie Oliver Group, told FEJ. Menu development work for Jamie Oliver Group restaurant businesses, which include Jamie’s Italian, Fifteen and Barbecoa, typically takes place at live sites, but there will be opportunities for these brands to utilise the facility for such purposes in future, as well as for training. However, the main purpose of the kitchen is to be able to host external events, fundraising activities, media launches and R&D activities. It is also an area that staff are actively encouraged to use and socialise in. Ian Clow, Sales Director for Charvet, said that the multi-purpose requirements of the suite shaped the specification. The suite itself comprises a chargrill with Charvet ‘Diamond’ bar grid, an 800mm salamander with ceramic plaques, pasta cooker with steamer facility and digital temperature control, and a traditional gas solid top. In total there are three open gas burners — two rated at 6kw and one large 10kw with a wok adaptor stand — and a chrome-finished planca, as well as three traditional Charvet 2/1 gastronorm ovens. Additionally, the suite contains a series of integrated equipment including a Precision two drawer refrigerator and three Alto Shaam hot-holding drawers. The full story behind the project is featured in the December edition of Foodservice Equipment Journal, available to view in digital format HERE.